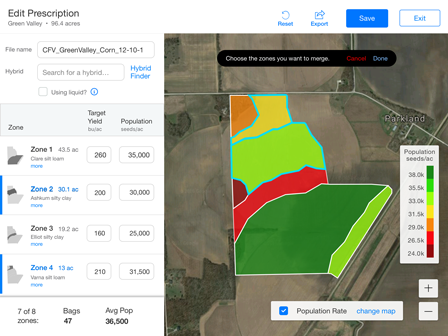 Climate FieldView™ offers two options to generate variable rate seeding prescriptions for your fields. Choose between Advanced Scripting that uses your field data to help you optimize your investment or manual scripting tools to help you save time and improve your productivity. Prescriptions are seamlessly sent to the FieldView™ Cab app, exported to MyJohnDeere, or downloaded when you’re ready to start planting to execute on your equipment of choice. Use multiple data layers to easily create customized seeding prescriptions with manual scripting. Use your historical field data, combined with proprietary field testing results, to generate planting scripts tailored to your unique yield or profitability goals. All scripts are fully customizable. The ability to go in to Climate FieldView™ and create a script and adjust it on the fly, because of a hybrid or condition change, makes this very effective. 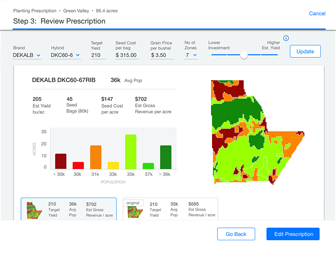 Build a customized fertility plan to get the most out of your yield variability with easy-to-use prescription tools. Simple tools for efficent time management. Plan your day more efficiently with accurate weather reports. View historical, real-time, and forecasted weather. Analyze weather trends to help make informed production decisions. Make operational decisions using Future Radar. Keep an eye on changing conditions with automatic notifications. Start every day with an email report of 24-hour precipitation total. Receive a text notification when hail is detected in a field.